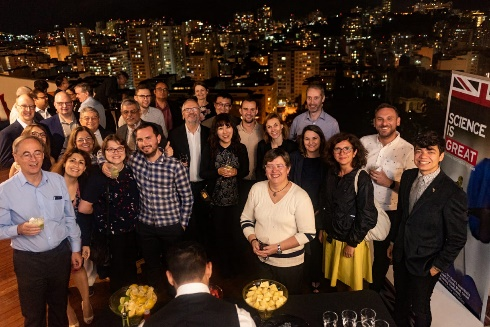 After the winter break in the Southern Hemisphere, Brazil’s position as a leader of science research was showcased, with several chemistry-related meetings happening all over the country. The focus areas ranged from CO2 storage and utilization at the International Conference on Carbon Dioxide Utilization (ICCDU), molecular magnetism at the International Conference on Molecular-based Magnetism (ICMM), new and advanced analytical science at National Meeting on Analytical Chemistry (ENQA) and diverse aspects of inorganic chemistry at the Brazilian Meeting on Inorganic Chemistry (BMIC). These concentrated activities coincide with the Northern hemisphere summer break, making it possible for international speakers to come over and bring the right international flavor. Several engaged RSC authors and editors came and we were able to foster future collaborations. For the RSC, we are happy that the local community now easily recognizes our journals and we can show our commitment to increasing the submission and publication of high-quality work from the region. UK-Brazil Year of Science and Innovation network reception at the British Council residence in Rio. The ICCDU had partnered with the UK-Brazil Year of Science and Innovation, and so a UK delegation was deeply involved in several activities (Profs Michael North, Peter Styring, Katy Armstrong) as well as the Editor-in-Chief of Green Chemistry, Prof Philip Jessop. The event was included on the Year calendar web site. Above is a photo of the main networking event during the meeting, which brought together Brazilians and international researchers. The RSC offered several poster prizes on behalf of our sustainability and energy journals, and wish to take the opportunity here to congratulate the winners: Adriano H. Braga from the University of São Paulo in Brazil won the Sustainable Energy & Fuels prize; the Energy & Environmental Science prize went to Juan Arturo Mendoza-Nieto from the National Autonomous University of Mexico (UNAM/Universidad Nacional Autónoma de México); and the Green Chemistry prize was awarded to Mathias Smialkowski from Ruhr-Universität Bochum in Germany. ICMM is a joint community gathering that brings together chemists and physicists, together with biologists and materials scientists for deep and focused discussions on different topics in the field of molecule-based magnets, including metal organic frameworks, modelling and theory of electronic structure, magneto-chiral and frustrated systems, bio-magnetic phenomena, and magneto-optic and magneto-caloric nanomaterials. Left to right: Jonathan J Marbey (Florida State University) receiving his prize from JMC C Advisory Board Member, Prof Roberta Sessoli; Luca M Carrella (Univ Mainz-Germany) centre, receiving his prize from Profs Miguel Novak (conference chair) and Inorganic Chemistry Frontiers Editor-in-Chief, Song Gao; Marcus J Giansiracusa (Univ Manchester-UK) centre, receiving his prize from Dalton Transactions Advisory Board Member, Prof Masahiro Yamashita and the conference Chair, Prof Miguel Novak. RSC offered poster prizes and we wish to take the opportunity here to congratulate the winners. Jonathan J. Marbey from Florida State University won the Journal of Material Chemistry C prize, which was presented by one of the journal’s Advisory Board Members, Prof Roberta Sessoli from the University of Florence in Italy; Luca M. Carrella won the prize from Inorganic Chemistry Frontiers, which was presented by the journal’s Editor-in-Chief, Prof Song Gao and conference chair Prof Miguel Novak; and Marcus J. Giansiracusa received the Dalton Transactions prize, which was presented by the conference chair and one of the journal’s Advisory Board Members, Prof Masahiro Yamashita. What an honor for all of us. 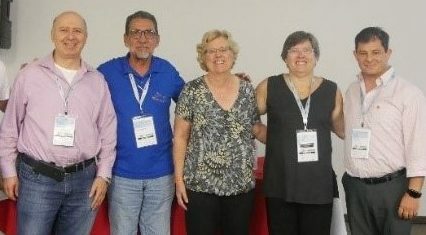 The Meet the Editor session at ENQA; pictured from left to right: Prof Dion Dionysiou, Prof Jailson B de Andrade, Prof Susan Lunte, RSC Editorial Development Manager Beth Magalhaes, and Prof Carlos Garcia. ENQA was something else! With more than 1200 attendees, the meeting was a celebration of their achievements and the internationalization that is clear. Prof Wendell Coltro of Universidade Federal de Goiás (the Federal University of Goiás) did a fantastic job helping us organize a Meet the Editor session; he brought along Prof Carlos Garcia, who serves as an Associate Editor for RSC Advances, to join efforts with Prof Susan Lunte and Prof Jailson B de Andrade, who serve on the Advisory Board and Editorial Board of Analytical Methods, respectively. 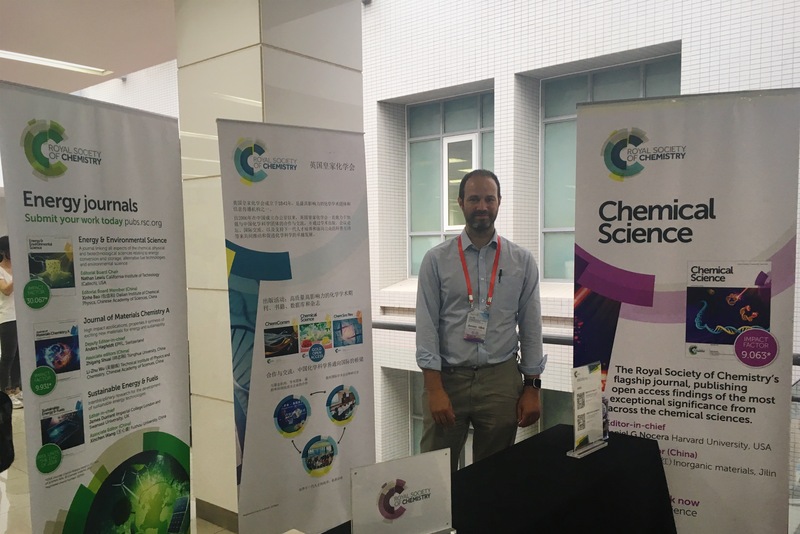 Prof Dion Dionysiou from the University of Cincinnati, an engaged author and Editor of the new Chemistry in the Environment books series, was also present to give some tips. Prof Marcia Mesko, JAAS Lectureship awardee from Univ Pelotas-Brazil, was also honored during the event. 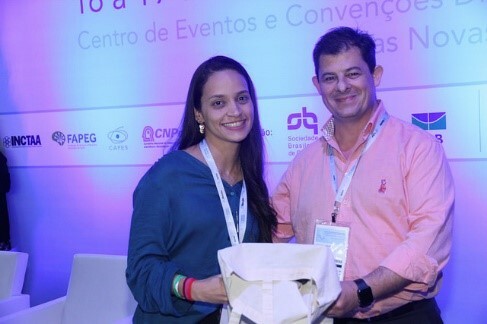 Tayane A. Freitas (UFSCar-Brazil) receiving her RSC Advances prize from Prof Carlos Garcia. We just could not compete with the parallel section on Women in Chemistry, which goes to show how the Analytical community are discussing diversity and inclusion. Related to that, Prof Marcia Mesko from Universidade Federal de Pelotas was also honored for her recent achievements. 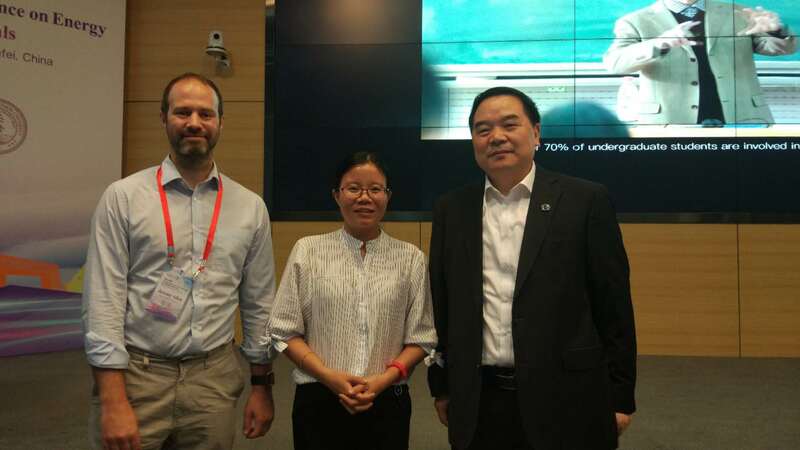 She was awarded the JAAS Lectureship in 2018 and was selected for both the 100 Women in Chemistry and Young Analytical Scientists web collections, which include her recent paper from JAAS. She is now an Advisory Board Member for JAAS; she also currently serves as the Analytical Division President at SBQ, the Brazilian Chemical Society, and will be organizing the next ENQA. Analyst/Analytical Methods and RSC Advances offered poster prizes and we wish to congratulate the winners. The Analyst/Analytical Methods prize was given to Bernardo F. Braz Universidade Federal do Rio de Janeiro. The RSC Advances prize was awarded to Tayane A. Freitas from Universidade Federal de São Carlos and we took took the opportunity to have Prof Garcia present it. BMIC has a long-lasting relationship with the RSC and its Inorganic Division. This time the event went to Fortaleza, the Brazilian capital closest to Europe that is also easy to reach from North America. Perhaps lured by the lovely sightseeing and beautiful beach, the event brought renowned academics from around the world to Brazil. Americans including Prof Thomas Meyer from the University of North Carolina at Chapel Hill, Associate Editor for New Journal of Chemistry Prof Debbie Crans from Colorado State University, and ChemComm Associate Ediot Prof T. Don Tilley from the University of California, Berkeley, joined international attendees like Prof Peter Junk , also an Associate Editor for New Journal of Chemistry, from James Cook University in the UK, Prof Osamu Ishitani from the Tokyo Institute of Technology in Japan, Frank T. Edelmann from Magdeburg University in Germany, Cedric Fischmeister from Université Rennes 1 in France, and Brazilians like Photochemical & Photobiological Sciences Editorial Board Member, Prof Mauricio Baptista from the University of São Paulo. 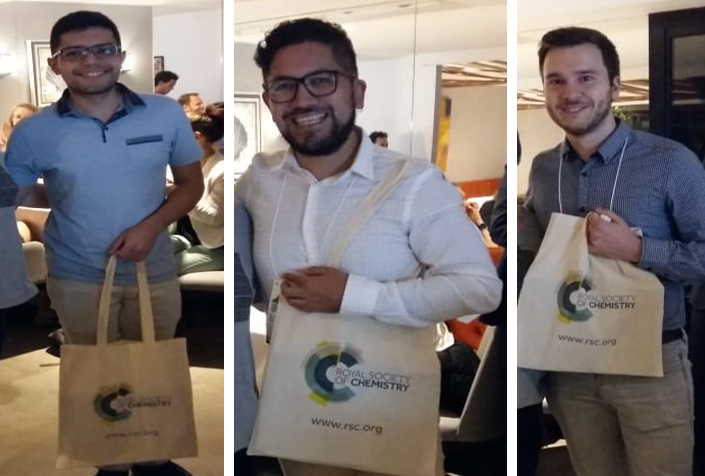 Left to right: Poster prize winners Isabela Moreira Soares Diógenis (UNICAMP , Brazil); Santiago Rostan (UdelaR, Uruguay); Victor Eulogio Lopez Guerrero (UNAM, México) with Peter Junk and Don Tilley. 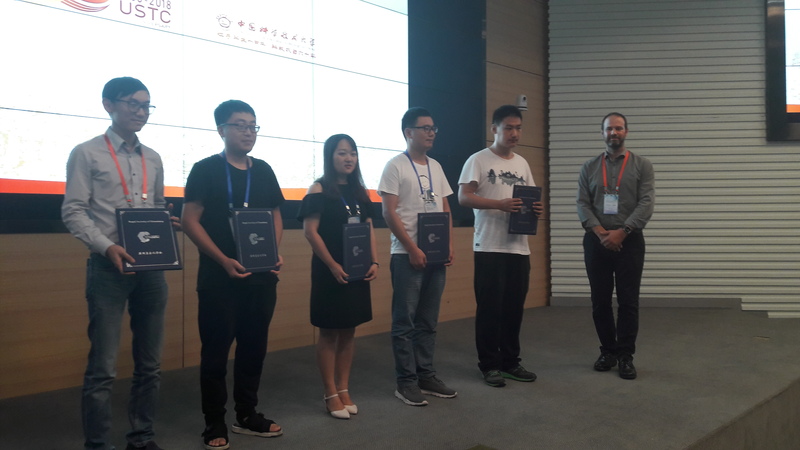 Our journals Nanoscale, ChemComm and Nanoscale Advances awarded poster prizes and we would like to say congratulations to the winners: Isabela Moreira Soares Diógenis from Universidade Estadual de Campinas (UNICAMP) in Brazil, Santiago Rostan from Universidad de la República(UdelaR) in Uruguay, and Victor Eulogio Lopez Guerrero from Universidad Nacional Autónoma de México (UNAM) in Mexico. The winners received their prizes from Profs Peter Junk and Don Tilley. As a final message, we would like to encourage the Brazilian community to continue its engagement with the RSC. There are many ways to engage with us, such as using social media to participate in online discussion forums and promote events, by tagging our twitter account @RoySocChem to start a conversation with us, and taking advantage of relevant hashtags; researchers can explore our grants opportunities, dig into our events page, explore and read our portfolio of journals, magazines (ChemistryWorld and Education-in-Chemistry) and databases, and approaching us with ideas. We understand that the success of our community depends on our ability to encourage and nurture the talent of the best people, regardless of who they are or their background. You are currently browsing the archives for the UK category.